I will be going to Anchorage to hang the show and attend the opening! Thank goodness my buddy, Constance Baltuck is also opening a Solo Show in Grant Hall at APU – a few steps away from my gallery. We are both working on publicity, shipping, and managing the stress of preparing for a show and showing in a brand new venue and city. It has always been great to have Constance’s studio just down the hall from mine, and it is better than great to be able to have an opening while she has her own opening. Showing fifteen new paintings in a new place is exciting. Anchorage is ten times bigger than Juneau, and although we are part of the same state, we are more than 500 miles apart! I know lots of people from Juneau who visit Anchorage, and lots of Anchorage people come to Juneau on State and Legislative business, so I hope my landscapes will remind them of the rainforest! 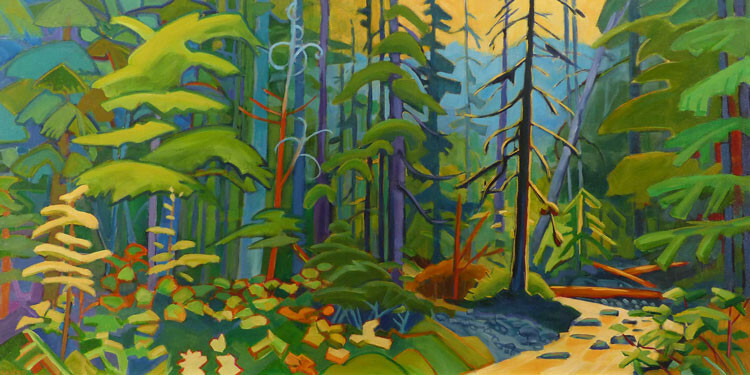 I have some paintings based on a trip north to the Yukon, interior landscapes will be included. My husband and I took the ferry north with our Scamp trailer in September, 2014. The colors were fabulous and the interior vistas were spectacular. The ferry trip is always great, reminding me of many trips, beginning in 1976! I have a some paintings of the ferry journey, the abstract shapes and my own memories of ferry rides made it exciting to work on these canvases. I will add photos of the new paintings in the next few weeks, but right now I need to continue to work on the one on the easel!